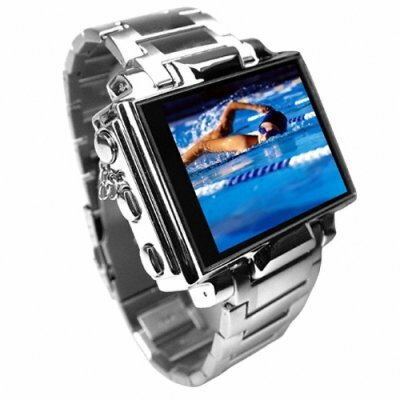 Successfully Added Ultimate Style 4GB Steel MP4 Player Watch - 1.8 Inch Screen to your Shopping Cart. Steel MP3 + MP4 Player Watch. In our effort to always bring you the latest and greatest new electronic gadgets, we now brings you this 4GB MP4 Watch with Full Color 1.8 Inch Screen and made completely from steel for the ultimate in style and coolness. i was deciding on which one to get this product or the Mens Metallic Watch MP4 Player 2GB - 1.5inch OLED Screen for $50.......im just conserned about the battery life on this product??? does any one know? Wasn't sure at first, but the quality is quite amazing! The packaging and instructions are very similar to those of a high-end watch you would purchase in North America. Quality of pixels are still blurry, perhaps it's the conversion at the moment, however, it's still a neat little gadget that you can use on the road during dead time along your travels. Just watched some zitcoms and news this morning on the way to work - really helped pass the time. Instead of staring at the person on the subway or the boring ads...pick one up just for kicks!